This is Karla and Ed Davis's other son Matt, and his wife, Megan. Their son is Alex (age 17 months). They live about 2 hours from Karla and Ed in Dallas (BOO!!!). 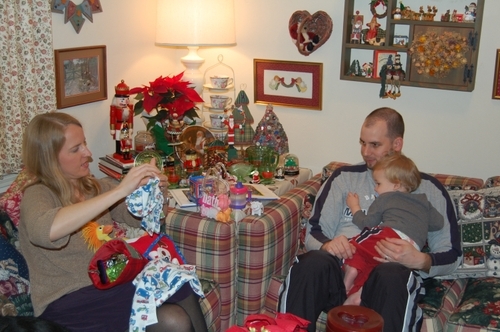 "We celebrated Christmas with both of our sons and their families on December 15th this year, since they were all going to be with the maternal grandparents on Christmas day. Unfortunately, Alex was quite sick that weekend - with an earache and high fever - so he was not his usual lively, cheerful little self. "